Azaan from the nearest mosque wake his senses & like every other day, Sardar Hussain sets out with his little trunk. Placing it on one side of the veranda, he gives the tattered rug a quick swish before placing it on the cemented floor. Offering his gratitude to the warm lights, to the morning breeze & to Allah for being so kind, he starts his day. 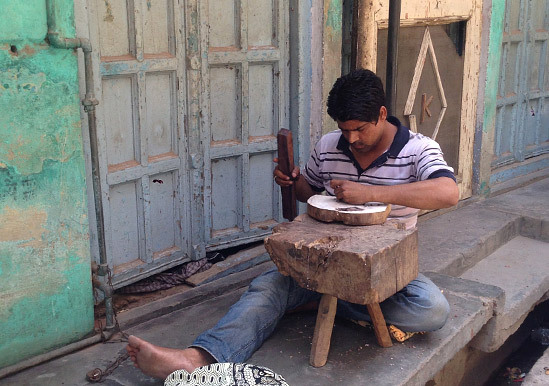 His tools, half done pieces & a small wooden bench create a small workstation of his own in the open air midst of the narrow lanes… Taking up the chisel & the unfinished block he makes the first beating, the mere sound of which creates a tune… Music to the carver’s ears! Sardar remembers the day he along with his family moved to Pilkuwa from Farrukabad, post partition, in mid twentieth century, getting along with him a wealth of skills. The region flourished, every street had a block carver’s den with young apprentices thronging to learn under a master, since this was the primary tool for printing.The supply chain was in motion from availability of raw material, supporting facilities and the final market, all elements were in place. Smaller towns and villages in the vicinity like Hapur and Chipiyana Buzurg with their printing karkhaanas (workshops) were already supplying base fabrics like canvas, bed linen, towels etc. to the well-established military cantonments during the British times. This laid the foundation of fabric manufacturing here and by mid-twentieth century the focus turned towards hand spun, handmade cottons called Khadi. The specialized products were bed-linen for domestic as well as export markets. 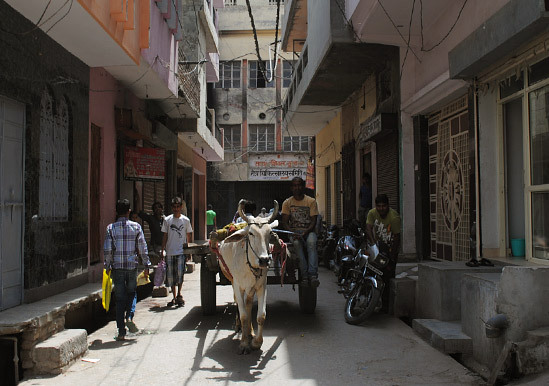 The streets of Pilkuwa used to be busy with bullock–carts fully stacked with textile, being transported for printing, dyeing, washing, packing etc. The market flourished till the nineties & then later saw a fast decline in the production of block as well as screen printing due to the entry of low cost machine printed goods, high production expenses and lack of appropriate market. Gradually, screen-printing took over the intensive block printing process, labor costs increased due to inflation and the products were unable to keep up with market demands. All pepped up, he walks up to his father one day & says“I have been listening to your stories & conversations from months & feel like I am a part of them now. I would be grateful if you could pass down your wisdom to me”. Warmed by his curiosity to learn, the old man sees himself in the little kid but all of a sudden withdraws. Determined! Every morning he would test & try by his understanding to create the same rhythm everyone talked about… After many such trials a similar but amateur rhythm echoes…pulling a string of old man’s heart… & he decides to finally give in. 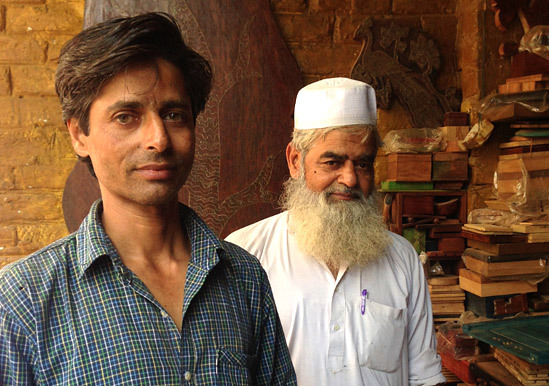 He teaches his son all he knew from the woods to the tools & the processes involved…“The primary timber used for Blocks is Shisham (Dalbergia Sissoo) & Teak (Tectona Grandis) carved on the vertical face that is perpendicular to the grain to ensure maximum resilience during impact in the stamping process (printing). 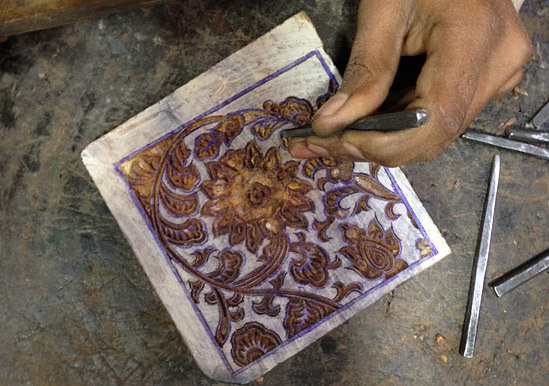 The cross section is angular and hence finer motifs can be chiseled out. Thus the carving cross section here is an inverted “V”. With use this sharp line becomes blunt. The work set-up is essentially a sun lit area, with low tables, on which the timber is carved. Each carver possess up to 30 chisels, a hand bow drill, wooden mallets etc. 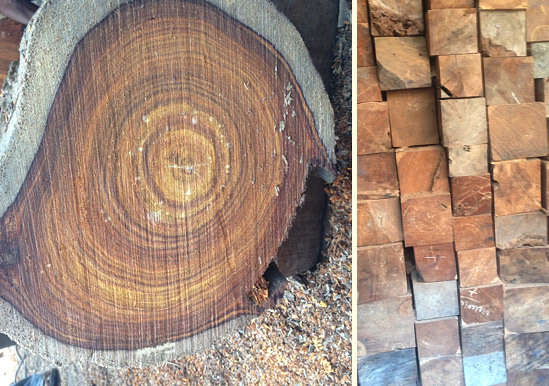 Marking of the timber and creating a smooth plain right angled surface is called Gunia. Next, marking of the drawing using a chisel is done known as Tiipna. 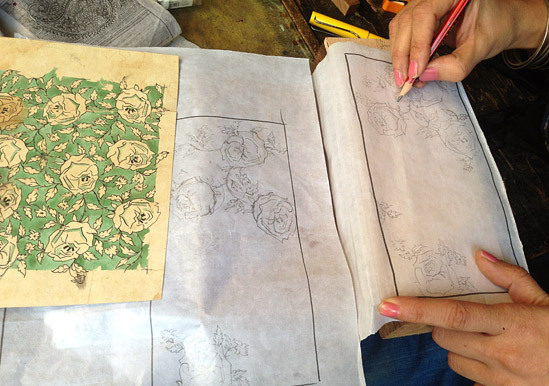 Now a day’s tracing paper is stuck to the wood & carved out following the guide lines. Carving process is carried out using various thickness and points of chisels as required, a wooden mallet is used with the chisel for absorbing impact. Rekh,is the Rekha which defines the outline of a block & Datta is the color fill in a block. All elements that need to be filled with color have a separate block assigned& lastly, Gad is the background fill.The most critical aspect is the ‘registry’ of the block;the precision of each block to correctly fit in its space in the pattern. The job of the printer is to correctly apply the blocks & to create precise components that ‘register’ perfectly to create modular patterns on impression”. The motifs are inspired from the existing vocabulary of motifs like Mughal Butta, the Soorajmukhi Jaal, Tree of Life, various flora and fauna,especially regal animals like elephants, lions and peacocks that have been documented by Arshad’s father, master of his craft, Sardar Hussain. These block carvers are often individual entrepreneurs and master craftsmen are trained over a period of minimum three years to learn this craft. The skill is honed and perfected slowly through the years & he works with a team of apprentices. 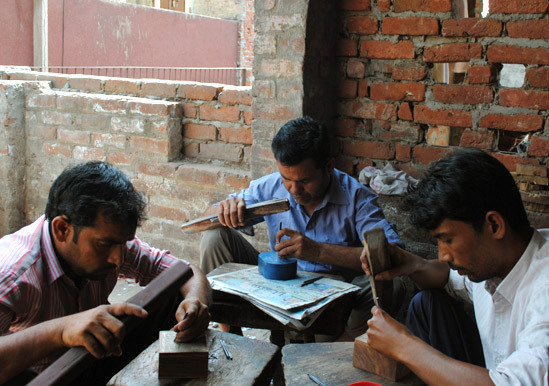 The artisans are highly skilled and block carving is considered a life skill that is taught to all young boys even today. Large sheds that home long tables for printing are still around but production continues in screen-print with only touches of block, for giving a handmade feel. The entire process is in order and geared for production, if it were to return. Father & son both have found an apprentice in each other finally& together the old learning& a young thriving mind create new beginnings…a new life out of these old blocks. The block carver is also the designer of his motifs. Once a mere printing tool, now a useful contemporary object, this block has been thoughtfully placed among many wooden surfaces, bringing them to life…. all with the same wooden mallet& the unfinished pieces. Sardar Hussain takes up his place on the rug; marching to the thumping tune… he makes the final mark! 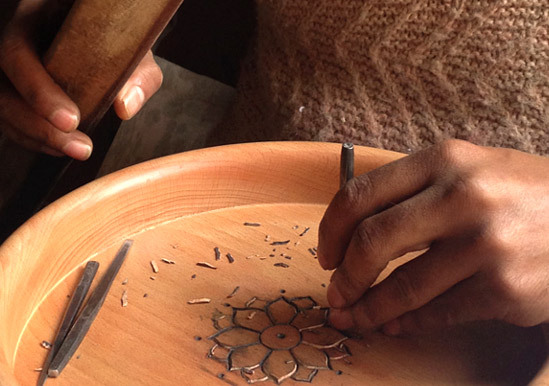 Organic Connect in collaboration with many such skilled masters started the Block Projectin 2009, inspired by the exquisite motifs of the Block carvers of Pilkuwa. It is inspired by traditional wisdom and skills to create meaningful objects for contemporary living. The range of products is designed keeping in mind this fine skill extending from exquisitely carved home décor objects, lighting and accent pieces of furniture. The uniqueness of this project lies in the transformation of the block as a tool for printing into a feature of value addition in contemporary objects for urban living. 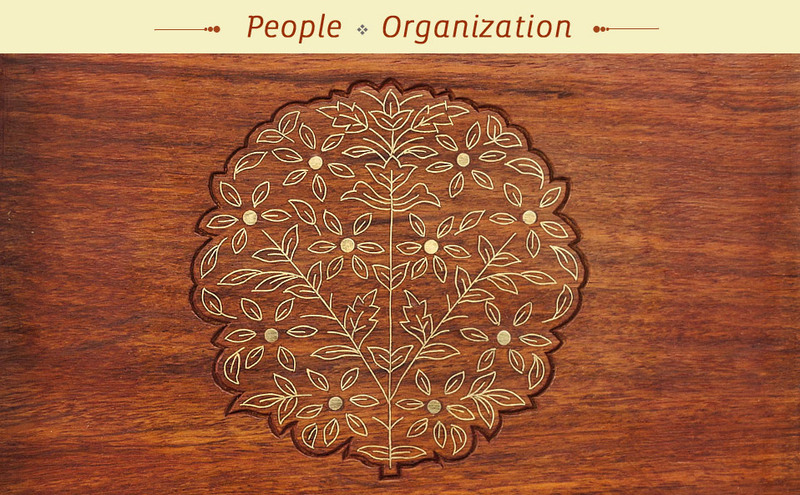 A critical collaboration in this project has been the inclusion of traditional carpenters who build the basic object.Once the base is ready, it is time to adorn the piece with carving and /or inlay by the block carver. The production is based on sustainable practices using pieces of heartwood in the form of slats, which are often leftovers of commercial production. Seasoning of the wood is done using the shade drying method where the wooden slats are seasoned by placing alternately in the sun and then in the shade as opposed to quick seasoning in a fuel powered temperature controlled seasoning plant resulting in an ecologically viable practice. The motifs are borrowed from the rich vocabulary of the block printed textiles, like the Soorajmukhi jaal, a full color sunflower pattern that was used for large scale surfaces like curtains and is now used as a leitmotif in many products. The objective of this project is to create a sustainable livelihood opportunity for the tremendously skilled artisans’ community and more importantly to continue evolving the practice. 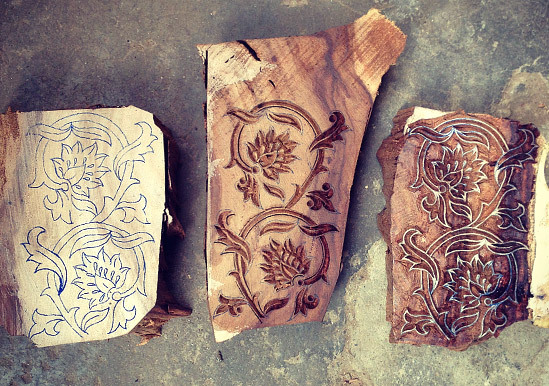 It has now become an established supply in the otherwise decreasing demand of block carving. This is an innovation required to shift the paradigm of crafts from its declining status to evolving. 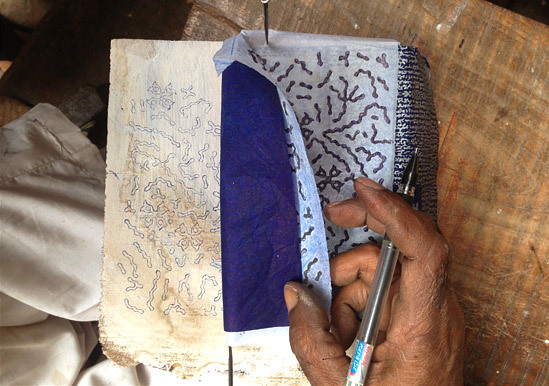 The idea has brought back the “Pride of Work” in artisanal practice, ensuring sustained livelihood opportunities. 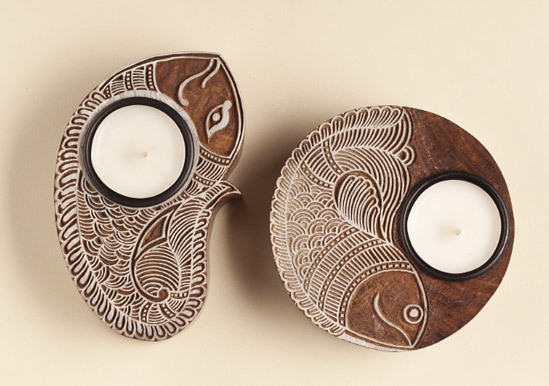 Felicitated by National Award for Crafts in 1981 and later been conferred the honor of Shilp Guru in2003, Sardar Hussain founded Sardar & Bros, an enterprise that produces handmade objects with block carving. Arshad Khan feel, the third generation skilled carver of the family is also a proud winner of the National Award for the year 1990. With a family of renowned & nationally acclaimed carvers Sardar Hussain with his sons travelled around the world to showcase their skills.